Welcome to Day 7 of The 7 Days of Valentine Projects Blog Event. It's hard to believe our second Holiday Projects event is already over! We had so much fun and I hope you have enjoyed checking out all the fun Valentine Projects. If you missed any along the way, you check most of the out in one place on our new Pinterest board. You can find our board here. You will find links to all the other participating bloggers below. Hopefully you can find time to look at their blogs and leave comments on any that inspire you. Happy Valentine Crafting! 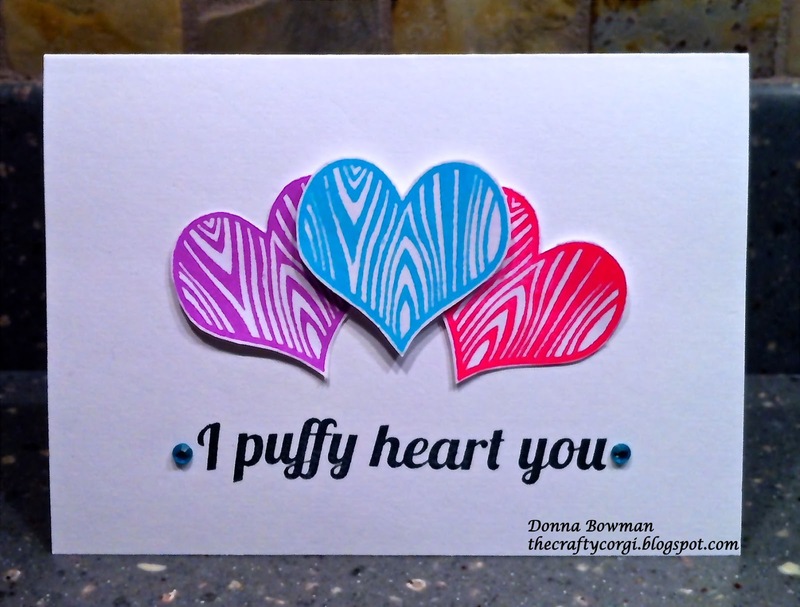 Today I have simple CAS Valentine I made using a new stamp set by Technique Tuesday and designed by my friend Teri Anderson called Puffy Hearts. I used Hero Arts Neon Inks in Blue, Pink and Purple with the woodgrain heart. I love all the hearts in the set and I stamped a lot of neon hearts and I hope to make many more neon heart Valentines this week. Cute card and the neon is so fun! Perfect! I love that sentiment. Great CAS design! love how bold this card is. gorgeous inks! FUN fun FUN! Love the mix of colours and that FAB sentiment too!